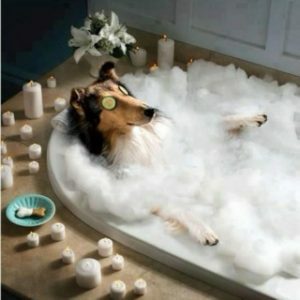 Home / dog training / How Often Should You Bathe Your Dog? Do you remember the last time you met a smelly dog? Even if you don’t, you probably can still remember the smell like it was yesterday. Every dog owner knows that a clean dog is always pleasant to be around, but a smelly dog can stink up your car, apartment, or even a public space. Clean fur and clean skin are essential to a dog’s (and a dog owner’s) well-being. But bathing your dog shouldn’t be a daily chore. In fact, it’s possible to bathe your dog too often! Doggy bath time is less of an “apple-a-day” way to stay healthy and more of an “as-needed” approach to maintaining your dog’s health and happiness. Not sure of how often to bathe your dog or why it’s important to do so regularly? Consider these factors. Your dog’s hair and skin is pretty similar to human hair and skin—it’s possible to over-wash both. Dog-safe shampoo improves and strengthens damaged follicles and moisturizes your dog’s skin while cooling him (great for hot summer days). Bathing can also fight infectious organisms and parasites, such as fungi, ringworm, and yeast infections. But when you over-wash your dog’s coat, you’re removing the healthy, natural oils that keep your dog’s skin protected and soft. Some hairless breeds require weekly bathing to restore protective moisture to the skin, but longer-hair breeds benefit from the protection of their fur. They can often go a month or six weeks between baths. Regular brushing can help keep surface dirt from your dog park, back yard, or floors from settling into your dog’s coat and onto her skin. It’s true that occasionally, you need to incorporate a bath into your dog’s grooming regimen to take out some of the most hard-to-remove dirt, but don’t let bath time become a substitute for brushing. Think that surface dirt is what’s causing your dog to smell? Give your dog a bath, then start a regular routine of daily brushing and plan not to give your dog another bath for about a month. In the meantime, keep an eye out for other skin issues as you’re brushing. You’ll probably find that daily brushing does the trick, and if it doesn’t, a trip to your vet is likely in order. You don’t want your friends to think that you don’t care for your pup or to avoid your dog because they think he’s not cared for (or just downright smelly). Bath time can be a great bonding opportunity for you and your furry friend, and it can be a way to make sure that he’s ready to socialize with his friends and yours. Bath time can be difficult to squeeze into busy calendars. That’s why KC Dawgz offers Kansas City dog owners convenient drop-off grooming appointments. Read about the services that we offer by visiting our Grooming page. When you bring your dog in to our location in Overland Park, our staff can help you make decisions about how often you should bathe your dog, which shampoos are best for your breed, and how you can keep your dog smelling, feeling, and looking his best.